Sara Livingston, 20, of Tarzana, left, fails to stop a shot by Brian Russell, 29, of Los Feliz, right, as the two cross mallets on a YMCA-owned roller hockey rink at North Hollywood Park. Bicycle polo, a derivative of the traditional equestion game, is gaining ground as a scrappy urban sport. Alex Dash still remembers the September day in 2007 when he discovered his new love. He had just witnessed a cyclist crash his odd-looking bicycle with one handlebar. It turned out that the cyclist, who had modified his bike to allow him to swing a mallet with greater ease, was a polo player. Dash, an avid cyclist, was intrigued. He was into road bikes, mountain bikes, fixed gears and any other type of bike he could find, but he had never heard of bike polo. The scrappy urban sport — a derivative of the traditional equestrian game — was gaining popularity in cities across the country, including New York, Chicago, Seattle and Portland. But it had yet to take hold in Los Angeles. Through an Internet search, Dash learned about a small group of players who competed on Saturdays on a tennis court at Los Angeles High School. When he mounted his old fixed-gear bicycle, wielding a beat-up wooden mallet, it was a moment of revelation. "I was like, 'I'm born to do this,' " said Dash, or Joker, as the 29-year-old photographer is known on the court.  Now Dash and fellow polo enthusiasts are asking for a city-sanctioned space where they hope to one day host world-class tournaments. Players will meet with the Valley Plaza Park advisory board Thursday to ask that they either be allowed to build a polo court or that the park's four tennis courts be designated as multi-use space. They picked the spot, Dash said, because the courts were in near perfect condition, rarely used for tennis. Craig Raines, a landscape architect with the city's Department of Recreation and Parks, said it's not unusual for park spaces to be set aside for a niche activity or designated as shared-use. There are spaces in Los Angeles already designated for model airplanes, archery and cricket, for instance. "What they do is very sustainable, especially if they're willing to share the space," he said of the polo group. 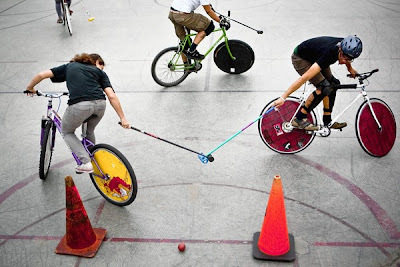 Since August 2007, when Madison, Wis., transplant Matt Vidal convened eight people for what players cite as the first public bike polo game in Los Angeles at Pan Pacific Park, the local polo club has grown to about 40 members. Players have tried different sites throughout the city. The current venue of choice is a YMCA-owned roller hockey rink at North Hollywood Park. To play the game, teams of three chase a street hockey ball across the court wielding long-handled mallets fashioned from ski poles and plastic piping. Most place colorful plastic covers on their wheels to keep balls and mallets from getting tangled in the spokes. The scene alternates between grace and mayhem as riders weave and dodge around one another and occasionally crash. Many players sport scars from on-court mishaps. Some don helmets, knee pads, goggles and lacrosse gloves. Like Dash, all have their polo names, including Lil' Sarah, Nola and Too $hort. The camaraderie of the insular community is part of what draws players like Amanda "Jinxy" Wainscott to the game. The 26-year-old graphic designer from Fontana drives two hours from work in Riverside to play in Los Angeles. "It's been a long time since I felt included in a group like this," Wainscott said. "I was such a sad, sad story of a loner, and then I got into the bikes." But it's also the strategy and adrenaline rush of the game itself that people love. Bicycle polo is more than a century old. Irish cyclist Richard J. Mecredy is generally credited with inventing the game in 1891. But the "hardcourt" style — played on hard surfaces rather than grass — has become popular only in the last decade, beginning with rough-and-tumble games among bike messengers. "It was like a demolition derby chasing the ball around," Guy Bagley, 36, said of the games he played with other bike messengers in Seattle beginning in 2000. Bagley now lives in Los Angeles and plays in the local club. As its popularity spread, the game has become more regimented and structured. Teams of cyclists travel thousands of miles to play in organized national and international tournaments.  A new organizing body, North American Hardcourt, composed of three representatives from each of the nation's seven regions — including Dash, who represents the southwest region — formed about a year ago to orchestrate events like the North American Hardcourt Bicycle Polo Championships, to standardize the rule of play and to help clubs pool resources. Increasingly, local clubs are getting officially sanctioned spots to play. In Vancouver, Canada, the city is building a court tailored to bike polo in one of its parks. Seattle parks officials recently gave their blessing, on a trial basis, for matches on some city tennis courts. And in Milwaukee, a group of polo players arrested for trespassing during a game in a parking garage had their tickets dismissed in exchange for fixing up a new county-sanctioned polo court. The push for officially designated bike polo spots throughout the country may be a sign of the game's maturation as a sport. Ben Schultz of Chicago, a Midwest regional representative to North American Hardcourt, said bike polo may be undergoing the same process that other young outsider sports like skateboarding went through. Once perceived as a nuisance, skateboarders now get their own publicly financed parks, and the sport has become big business. Still, Schultz said, bike polo hasn't lost the element of irreverence that attracted many players in the first place. "We haven't lost the fun — the beer drinking, goofing around," he said. "Crazy costumes can happen, weird bike adornments, crazy names. It hasn't been regimented to the point of sucking the life out of us."